LVIV, Ukraine -- Volodymyr Zelenyuk knew it was time to bolt when the pro-Russian separatists came to the carwash he owned in the eastern Ukrainian coal town of Antratsyt and demanded his help making and repairing weapons. Volodymyr Zelenyuk, 28, works at Ukrainian World. He and his wife fled their country, seeking asylum in Poland, where there are now an estimated 400,000 Ukrainians. “I don’t know what I am going to do if I am refused,” he said. Since the conflict that erupted early last year in Ukraine, the flow of immigrants and asylum seekers from there into Poland and other European nations has steadily increased. But the countries have been wary about welcoming them too warmly. Poland, Germany, Italy and other favored destinations for Ukrainian asylum-seekers have overwhelmingly rejected their applications or delayed processing them. The nations, which are loath to open their borders to what could be yet another torrent of job-hungry immigrants, point to vast stretches of western Ukraine that the separatist conflict has not yet touched. “The reason they are rejected is very obvious,” said Marta Jaroszewicz, the migration project coordinator at the Center for Eastern Studies in Warsaw. “Over the last 10 or 20 years, Ukrainians were essentially not present in the asylum numbers,” said Robert K. Visser, the executive director of the European Asylum Support Office, based in Malta. In 2013, 1,060 Ukrainians sought asylum in the European Union. Last year, after the conflict ignited in eastern Ukraine, the figure jumped to 14,040. Some Ukrainians in the bloc are on student or other visas or are awaiting decisions on permanent resident status. And in Poland, a deeply homogeneous nation with among the most liberal visa laws in the European Union and little experience dealing with large numbers of immigrants, the issue is particularly acute. Its deep cultural and ethnic ties to western Ukraine make it a logical destination, resulting in a surge of Ukrainians seeking jobs, education and permanent, legal residency. Dr. Jaroszewicz estimated that there were about 400,000 Ukrainians now in Poland, many of them having arrived since the conflict began. Last year, more than 300,000 Ukrainians applied for short-term work visas, the most common type of visa they seek and the first step toward obtaining what they most want: official resident status. 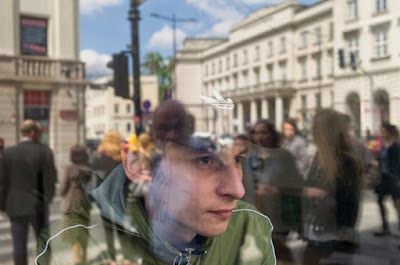 “The vast majority of Ukrainians who flee here prefer to apply for visas, rather than asylum,” said Ewa Piechota, a spokeswoman for Poland’s Office for Foreigners. For the thousands who cannot obtain such a visa, even under Poland’s more liberal regulations, asking for asylum is the only option. But the odds are bad. Mr. Zelenyuk’s experience is typical. He and his wife abandoned their car in Kiev and made their way to the Polish frontier. The Ukrainian border guard waved them through, even though they had no visa. On the Polish side, they filled out some forms, had photos and fingerprints taken and were told to report to a refugee center within two days. “The refugee center is basically in the middle of nowhere,” Mr. Zelenyuk said, wearing an Adidas cap and a Reebok windbreaker, recent acquisitions. Residents are given about $20 a month in pocket money, but there is little to spend it on. So, many, like Mr. Zelenyuk, head to Warsaw. He began volunteering as a handyman at Ukrainian World, a welcome center for displaced Ukrainians in a former nightclub space on Nowy Swiat, the city’s grand boulevard. A ring of long, thick keys dangled from his belt. Nearby, more recent arrivals, surrounded by their tattered suitcases, spread out across worn sofas while the center’s workers tried to help them find a place to stay. The elegant space, its walls lined with white columns, has an ornate tile floor ringed with the names of distant train stations — Gare de Lyon, Grand Central, Victoria — little more than impossible dreams for the desperate immigrants who pile up at Ukraine World. The Ukrainians can tap into a diaspora that has settled communities in several European states. That is why so many go to countries like Spain that do not normally attract large numbers of asylum seekers, Dr. Visser said. Last year, in the Czech Republic and Estonia, Ukrainians were the No. 1 national group seeking asylum. In Poland, Spain, Latvia, Cyprus and Iceland, they were second. Germany saw the largest raw number of Ukrainians wanting asylum, 2,705, but the nation is also the favored destination of immigrants from many other nations, including 41,100 from Syria. Still, it was better than the flood of immigrants from Kosovo and Serbia who pushed across the border into the European Union in 2014. Without even the justification of the conflict that Ukrainians face, only 8 percent of Kosovars saw their applications accepted, and just 2 percent of Serbs. Anastasia Pavlychenko, 32, sat on the carpeted floor of the Warsaw technical school where she was taking classes to qualify for a visa. The school, which runs on charitable contributions and aims to help immigrants win legal status in Poland, is straining under the rising number of Ukrainians seeking help. The school’s office is so new that, in the director’s office, the only furniture was a hastily assembled Ikea desk that swayed alarmingly whenever anyone touched it. A half-dozen other Ukrainians sat on the floor beside her. “I’m not even going to bother applying for asylum,” she said. Viktor Reka, 40, strummed softly on a guitar. An ethnic Cossack who fought during the Maidan uprising in Kiev that overturned the pro-Russian government early last year, he had the traditional chupryna hairstyle with a lock of hair protruding from a shaved head and a long, twisting mustache. Albert and Natalia Bakurova, ages 50 and 48, a married couple, had fled their eastern Ukrainian town more than a year ago. “We tried to make a living in Ukraine, but there was no work so we had no choice but to try to come to Poland,” Mr. Bakurova said. They have been rejected once for asylum, but have appealed. If they are rejected again, they will have no choice but to go back to Ukraine. Mr. Reka’s wife, Oksana, 34, a singer-accompanist, cleared her throat. “If you don’t mind, Viktor will play now,” she announced. Mr. Reka began strumming with greater fervor, emitting a slow, sad Cossack lament. A ribbon with the colors of Poland, red and white, was intertwined with a blue-and-yellow one, Ukraine’s colors, dangling from the neck of the guitar. “It is a song about coming back from the war,” Ms. Reka explained.